What Are the Benefits of Omega XL? Omega XL brand-name supplements contain a combination of omega-3-acid ethyl esters that provides you with nutrition that may potentially ward off arthritis and different types of cancers, as well as reduce your risk of heart disease, the University of Maryland Medical Center reports. The food sources for omega-3 fatty acids include seafood, tuna, halibut, algae, krill, fish and nuts. Both eicosapentaenoic acid, or EPA, and docosahexaenoic acid, or DHA, make up the omega-3 fatty acids. Doctors often recommend omega-3 supplements for fighting high cholesterol and heart disease. Speak with your physician before you start taking Omega XL. Increasing your intake of omega-3 fatty acids with supplements such as Omega XL will help lower your blood pressure, Gale Malesky, author of "The Definitive Guide to Health Supplements," reports. The fish oil helps to decrease the cholesterol levels in your bloodstream, which also widens your arterial openings allowing for better circulation of blood. Studies suggested by the University of Maryland Medical Center report that omega-3 fatty acids such as those contained in Omega XL play a key role in helping your body increase its level of calcium that helps protect and strengthen your bones. Other studies report that the lack of omega-3 fatty acids in your body can lead to decreased bone density. The combination of omega 3-fatty acids in Omega XL lowers your cholesterol and prevents heart disease. Omega-3 fatty acids also decrease your risks of a heart attack or stroke because they help keep your arteries clear of blockages. The harmful level of triglycerides, a part of cholesterol, in your bloodstream decreases and your health improved, Malesky states. The University of Maryland Medical Center concludes per studies that fish oil may decrease lupus symptoms such as tiredness and joint-related pain. Lupus is a disease involving your nervous system and joints that causes severe pain. Lowered risks of arthritis, cancer and heart disease, have been associated with the consumption of omega-3 fatty acids, Malesky relates. You will experience less joint pain associated with arthritis, fewer problems with blood pressure and arteriosclerosis, and less chance of a diagnosis of cancer. This positive effect on your health indicates the importance of omega-3 fatty acids in your diet or as a supplement. The University of Maryland Medical Center reports that studies indicate that omega-3 fatty acids can help alleviate mental depression and or mental illnesses. 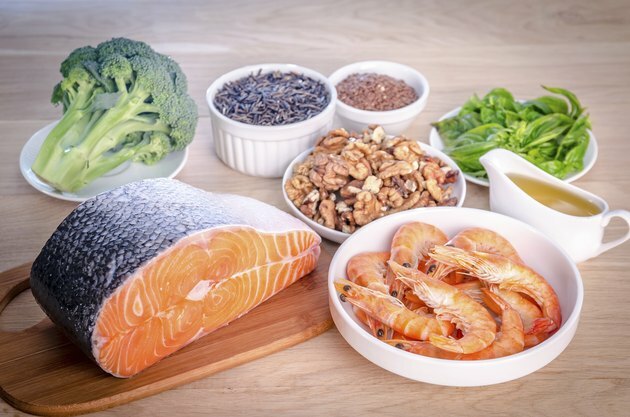 Omega-3 fatty acids added to antidepressant therapy have proven to have a positive effect on the symptoms of depression, the organization indicates. How Do I Use Omega-3 for Antidepressant Withdrawal Symptoms?